Former Bandits player Shawn Williams greets John Tavares before Saturday’s game. The memory of Williams’ late son, Tucker, was honored. 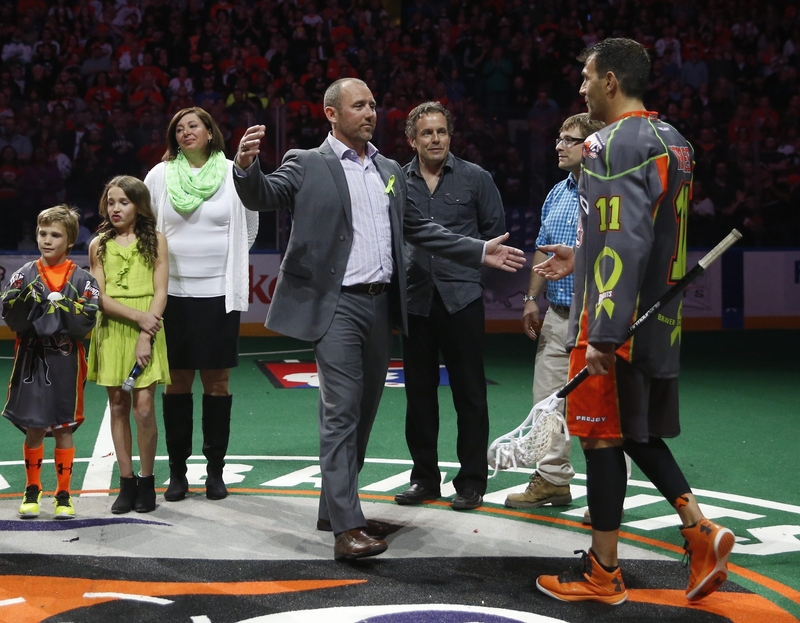 Former Buffalo Bandit Shawn Williams might have set a National Lacrosse League record on Saturday night: most hugs at a pregame ceremony. Williams hadn’t seen a Bandits’ game this season before Saturday night. He has exchanged texts and emails with some of his friends on the team. Williams was a little overwhelmed by the show of support on Saturday, which created plenty of emotion. Williams currently is a free agent. He hasn’t put away the idea of playing in the NLL at some point again. “As training camp approached, Tucker was quite sick. I fully expected to play for Tucker. It was something I looked forward to doing,” Williams said. “But that took a back seat. I didn’t push the envelope too much, and it didn’t work out. Sometimes such an emotional night can leave a team drained by the fourth quarter, but Mark Steenhuis said the Bandits were determined to win this one. The Vancouver Stealth came into the game in an unusual situation. This week’s game didn’t matter to them; next week’s game means everything to them. Entering the weekend, Vancouver had a 5-11 record, a half-game behind Calgary’s 6-11 ledger. Those two teams play next week. If the Stealth win that matchup, they’ll take the third playoff spot in the NLL West via tiebreaker. If the Roughnecks win, they’ll advance. The schedule-maker of the NLL didn’t do the New England Black Wolves many favors when it came to the team’s schedule at the end of the season. The team had two games slated this weekend – a visit to Rochester on Saturday night, and a home game Sunday night against the Bandits. Then New England had two more games next weekend, with a game in Toronto on Friday and an appearance in First Niagara Center next Saturday night. The Black Wolves needed everything to go right the rest of the way to reach the playoffs. Unfortunately for them, the Bandits won their game to wrap up a playoff spot. Coach Blaine Harrison believes his team is closer to the top of the league than its 4-11 record shows.